As I sit writing this post on the longest night of the year, the Winter Solstice December 22nd, I can say I feel what I see in this photo I took in early December running through my consciousness. Like this forest scene I'm also releasing layers of last year's bloom that no longer serves me and I too am moving into winter's stillness. If my emotional baggage that I'm consciously working towards shedding could manifest into form it just may look like burnt brown leaves trailing from my feet. What's exciting is that above there's hope of new life to come in the New Year radiating from the sun's soon to be reborn light. Although we will not notice days lengthening in light until February we can at least know it is on the horizon. The year's end holiday season for me is spotted with lights of joy such as when I went pre Christmas shopping with my 1 year old son Krishna and he requested by way of pointing his finger that I take the Santa hat off the shelf and put it on him. Here he smiled from ear to ear. I've also enjoyed fulfilling my teenage son's request to go perfume shopping with him for the girl he has his heart on. I have also been adoring my husband's companionship who although he loves to have a good time and encourages me to receive more than I do, he from my perspective can be very annoying in a loving sort of way as he tirelessly coaches me day after day to burn the bad memories, judgments and resentments I carry within my consciousness. You see my husband is super connected. What I mean by this is he can see through my ego and all the mind patterns I have that hold me back from living in the moment. I know you maybe thinking that this is lovely and where can I find a partner like this as well however let me share with you that it ain't easy having your ego called out several times a day yet spiritually well worth it to be living with Deepak Chopra times 10. I'm grateful for these great holiday gifts I have that don't come wrapped up however the Christmas season always has an under current of being bittersweet for me because I miss my Dad. If he were still in his body he would be humming along with me to Bing Crosby's Christmas carols as I patiently wait along side the bar at Starbucks for my freshly brewed coffee. This memory is a delight although Bing's voice without fail makes my eyes leak and my smile shine. In addition to experiencing my holiday highs and lows, feelings of what has inspired me most in the past year fill my consciousness. What I dream for in the coming year is to take a bath everyday in my inspiration. Like a great perfume I want my inspiring moments to last throughout the day and most of all out smell the uninspiring moments within my consciousness. Having had the great pleasure to sit at the lotus feet of beloved Buddhists Masters like the Dali Lama, Geshe Michael Roach, Lama Christie McNally, Robert Thurman and Sharon Salzberg I've learned that setting goals is never a good idea. Therefore I encourage you to throw out your 2012 New Year's resolutions list like the lists I used to make because as you may have already experienced year after year everything in life changes into something other than what you have planned. You can't control your life. What's the old saying "Man rows, God steers." I'm referring to what the Buddhists call impermanence. The teaching that nothing, including a thought lasts forever. Instead everything evolves and transmutes into something else. From my personal experience the great part of understanding impermanence is that if you let go to the natural process of your life with a dash of feeling and healing along with handfuls of high vibe thoughts, words and actions everything in life turns out better than expected. You may get upset over being denied a job, not getting pregnant, having lost a partner or a friend yet when you understand impermanence you will see the lose of a connection as protection. Never, ever be attached to a result and you'll see life will be better than your wildest dreams. Because of the divine law of Impermanence I suggest you reflect deeply on your dreams. Similar to the dream I shared of being bathed in daily inspiration. When you sit with your dreams and feel them you'll notice there's a big difference between goal setting and dreaming. Goals are practical, knowledgeable and made up of fixed mind stuff while dreams uncover your truth and morph over time. Dreams are a feeling that comes from your belly, your 3rd chakra. Your center of knowing who you are, your sense of belonging and your power is born in this center. I'm sure you've experienced saying a "Yes!" from your gut or felt a deep thud in your low belly when you were feeling "Absolutely not!" My suggestion is to not be shy, feel your truth coming from your belly and dream big. My present life experience is all about shedding wasted thoughts and burnt out relationships, believing in myself and fully receiving my childhood dreams. Since this is a period of deep healing and transformation for me, daily I'm actively working on holding onto the vibration of growth and expanding it by repeating the mantra "I don't know how? I don't know when? But I do know, what I want is coming to me." Repeating this attraction mantra works because it erases the ego part of our consciousness. You are left being open hearted, hopeful and in the moment at hand. This is a key component to understanding impermanence. There's one catch, in order for this attraction technique to work, you must genuinely believe in these words and not have a smidgen of doubt within you to trip you up. A bit later in this post I'll show you some 3rd chakra specific standing yoga postures to practice where you can put this intention into your body. Also the word WHEN in this recitation is big. You never know when your dreams will arrive. Maybe this year, the next or in a decade or two. Do remember that everything changes, sometimes in a snails pace or like the speed of receiving an email that was just sent to your inbox. Regardless, if you're looking for change in your life it starts with you. You can begin the process now. Don't go wasting your time waiting for others to change. If any of this resonates with you I suggest you start attracting what you want by repeating the mantra "I don't know how? I don't know when? But I do know what I want is coming to me." As Mother Earth continues to shed, she anticipates sitting in winter's chill where she can rest and reflect. Perhaps she's manifesting as her New Year's dream that we can serve her as well as she has served us for ions of time. She's singing within the whistle of the brisk wind "I don't know how? I don't know when? But I do know what I want is coming to me." By week's end my family and I make sure to take a nature trail walk. Here we connect with the Great Goddess, Mother Earth. During our walks I always notice how my boys race ahead of me while I watch them disappear into the distance. Here the whisperers on my path speak with a fiercer tone in addition to throwing me a few crumbs to chew on. During an early December walk this tree's steel color in comparison to the other tree's in the forest spoke to me. As I looked into it and absorbed this tree's energy I noticed the color combination of this forest scene and I felt how receptive these tones are together. Grey, deep brown, burnt orange and gold. Grey like black and white always sets a neutral tone for me while the burnt orange brown and the sun's golden amber streaks warms up the scene. This forest photograph is my pre Christmas holiday closet color inspiration. During Christmas week I'll drop my neutral nature splashed with golden tones and add a little bit of red and green into the mix. I do this because Christmas is about red and green yet if anyone asked me "Why the red and green? "I would say "I wear red and green to celebrate the ripening of the Holly Tree." More specifically to honor the Holly King. Legend states the ripe red berries from the Holly tree's branches represent great health and vitality. By New Year's day the berries start falling and bleeding on the earth. This is a sign that the Holly King's death is very near on the horizon. To take his place the spirit of the Oak tree will grow until his ripening, June's Summer Solstice. The Holly and Oak tree are said to be twin souls. When one reigns the other rests. If you look closely into any nature scene in the Northern Hemisphere at this time you will see ripe Holly trees and plenty of red berries on various types of bushes. Be sure not to eat them. Here I'm wearing my early December inspired forest colored threads. Fortunately I was able to go coat less on this week's trail walk since it was an unusually warm December day. I found a nice sun lit open space in the forest where Amit, my husband took a few snap shots of my current standing yoga posture flow. Breathing in lunge allows the sun I saluted at moment ago to move into my lower body. Soften your eyes, jaw and forehead as you inhale and lengthen your neck spine. Exhale and soften your eyes as you look forward and down. Grey poncho gifted from my Mom when I was nursing Krishna. Gently place your right hand on your right thigh as you exhale and press your thigh down and back. Inhale as you pull your chin away from your chest and drink in the winter sun. Allow the sun to move down your throat, into your heart and be absorbed by your digestive body. Your third chakra. Inhale as you create space in your left ribcage. Here you can deepen your ability to absorb the sun's sweetness. As you stand in Warrior 2 feel your knowing of who you are and what you want to grow. Our 3rd chakra is golden in color. Ancient yogis say this is where the sun's energy enters us and ignites our inner light to do anything. The element of fire is associated with this chakra. Deepen your inhale as you open the accordion of your ribs and let the sun shine in. Feel then visualize your New Year's dreams. In this transition pose find air in your chest and space within your throat cooling your fire. When our fire, our 3rd chakra, is out of balance our ego is blazing through the roof. Our mind, our practical side is the part of our consciousness that will get us back into goal setting and not dreaming and manifesting our truth. Breathe into this neutral pose and continue to cool your fire. Feel equal parts of heaven and earth within your consciousness. throw some more wood, a poor thought or bad memory, into your fire as you breathe, feel and burn it in this deep twist. Wow! I love this shot because the orbs and rainbows are exactly what I'm feeling are entering me as I soak in the sun and squeeze old toxins and non serving mind patterns out of me. Exhale as you lengthen your legs. Breathe and let go into this cooling forward bend. In search of more sun inhale yourself up halfway. Exhale into standing. Inhale as you throw a few more wasted thoughts and non serving baggage into your fire center. Exhale as you mindfully let it go. Continuing the cycle like the wheel or Yule of the year, return to a lunge. Rather than immediately practicing on the left side let's make a little more space in our back body by shedding a bit more in a deep exhaling posture. You can call this pose an inversion because your head is lower than your heart. Let whatever it is in the moment that's blocking you go. It could be a thought infused with jealousy, lust or anger that lasted for only 3 seconds within your consciousness. Burn it. These 3 second thoughts count as obstacles in manifesting our dreams. Breathe, feel what comes with these thoughts and once you let them go you can move into a life worth writing about. Late November's blazing colored foliage is breath taking. It's peak color lasts for only days and if you're lucky you'll catch a tree with streaks of sunlight highlighting it. When I see a North Eastern autumn tree in fiery sunset colors there's a part of me that sees a real fire. A sense of cleansing comes over me, letting go of last year's bloom and making room for the New Year's growth to come. By the time you're reading this post the fire in the trees has evolved into dead dry brown leaves which crackle underfoot as we're guided most of the day by the great white pearl in the sky, the moon. She eases our senses to rest as she dances across the ballroom of the ink blue night sky. 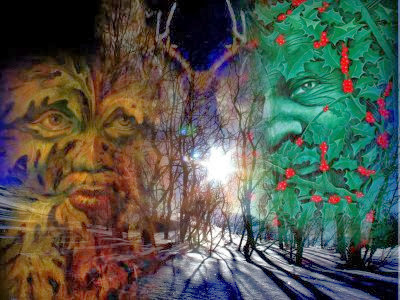 In less then a month's time the sun will be reborn on December 22st, the Winter Solstice. Although we won't notice it for months, each day's light will be growing in length. As we presently experience the dark, dead and dormant period of Mother Earth's flow here in the Northern Hemisphere our instinct guides us to spend more time indoors holding a cup of hot tea while escaping the air's growing chill. As a result of warm weather's sun lit activities on hold for a bit it is less of a struggle for us to slow down, look inside and reflect on the past year. Can you revisit in your thoughts events from this past year that were good, bad as well as neutral? What I've experienced is, if I just close my eyes and reflect on the past year usually the highs and lows stand out with exclamation points in my memory while the neutral events are left behind. Therefore my suggestion in doing this late fall cleansing ritual is adding some material research you can touch and see with your own eyes. I'm a natural journal keeper and picture taker therefore it is easy for me to open up my personal notes and remember my past year's events as I read through my diary and scan through my photos. Let's say you don't take notes on yourself or take pictures but you do have a pretty full inbox of old emails, documents stored, bank statements and a few photos saved that were sent to you. My suggestion is to carve out the time in your schedule and prioritize reviewing your past year. Look at everything. Include the good, bad and neutral events. Doing this not only makes you aware of your past year's experiences but this process also allows you to breath in and feel what you may have bypassed feeling when whatever you experienced was first presented to you. Time and space from any event will give you a fresh perspective on what happened last March, July and September. Sit with your memories inhale them in, feel them and exhale them out while visualizing them as leaves shedding from a late autumn tree. We are left with branches, our energy system, expanding outward and upward while silhouetting the spacious sky above. See the sky's vastness being absorbed by your consciousness as a result of practicing this exercise. Our new found space now has the room to attract infinite possibilities for the year ahead. In addition to what I call my "Dark Day's" ritual where I review my journals, photos and receipts I also include paying respect to my ancestors. The month of November starts with an echo of what my Irish ancestors call Samhain and modern folk call Halloween. A day which celebrates the thinness of the veil between the two worlds of material and spirit. During the first days of November I was raised to celebrate All Saint's Day, November 1st and All Soul's Day, November 2nd. This Catholic and proper childhood memory of remembering the dead at this time plus November 21st which celebrates what would be my Father's birthday if he was still in his body along with me having thick Scorpio traits of loving the whole death rebirth concept, I can't help but to light a few candles at this time and call out to my Dad along with a few other mentoring spirits to assist me as I move through tying up this past year's loose ends along with believing in myself enough to move into who I want to become in the next year. As birds fly towards warmth and light my senses follow them in search of hearing my guidance. During this season's period of darkness and feeling a void, I encourage you not to fill up all your time by staying busy, not feeling and shopping away. Rather make the time to light candles, slow down your mind and ask for guidance. One day in class I suggested to privately call on a guiding spirit you personally adore and ask them to send you a sign of hope for the New Year. No joke, an elderly and chatty man whom by the way is a riot said "Clark Gable!" Not expecting to hear from anyone I opened my eyes along with a few others and giggled. You see we all have crushes along our path, people we admire who carry an energy we could use a dose of. Call on them. You will be surprised and love how they will illuminate you as the days go by. Feel both feet ground into the earth. Being a Halloween baby I have a fondness for this season. I love the layered sunset colored cozy clothes we get to wear, an occasional whiff of chimney smoke in the brisk air as well as late autumn's constellations that show their brilliance in the night sky. After Halloween in my neck of the woods, New York City, you can see the constellation Phoenix rising along the horizon. This star is best viewed spreading its wings on a clear Black/New Moon night. 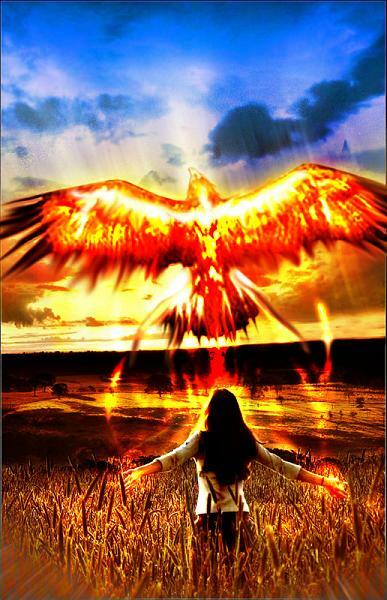 The Phoenix is a mythical bird who Father sky cleverly shines above us as Mother Nature sits in death and darkness awaiting the Sun's rebirth in late December's Winter Solstice. The Phoenix is said to rise from its own ashes every 500 years. It is self created and completes the cycle of death and rebirth through fire. Legends from various cultures like Greek, Mesopotamian and Egyptian describe the Phoenix as a gigantic bird, who feeds only on air and has feathers that shine like a rainbow. My guess is the Phoenix's rainbow colored plumage represents our chakra system which is said by ancient yogis to travel with our soul and nadi system as we regenerate into our new body during each lifetime we experience. *Nadi system- refers to the thousands of energy channels that run through our body. Imagine a leafless tree. The trunk is a central channel which holds our chakra system and the branches represent all the other energy channels/nadis that run through our body. Eastern medicinal practitioners like acupuncturists as well as yogis work with these channels. The Phoenix is not the only mythical winged star that shines in the night sky at this time. A more obvious to view late fall constellation, even in the city, is Pegasus. The winged horse. Pegasus has a starring role in several Greek myths. He is associated with most of the conquering heroes. A myth that stands out for me regarding Pegasus is when Perseus, son of Zeus, rode Pegasus when he rescued Andromeda from a sacrificial rock. She was chained as an offering to Poseidon's sea monster so that her death could atone for her Mother, Cassiopeia's pride. Cassiopeia, a mortal, challenged the God Poseidon by stating that her daughter Andromeda was far more beautiful than any of his daughters. I first heard this Pegasus myth in college and I'm sure it stayed sharp within my consciousness because like Andromeda I've been challenged throughout my life by my Mother's pride. As a result of her small town Ecuadorian upbringing where she learned that if a wall is off white and your man says it is white you agree with him. Because of this subservient to men mind pattern I too like the generations before her believed you obey your man plus you never leave him. How can you blame my mother and other women like me for believing this? This is what we've been trained to believe at a very young age regardless of where we were raised. It starts with reading fairy tales like Cinderella, circling the F for female when you apply for a job, loan and so on... Even if my mom was a power house female activist like Gloria Steinem it wouldn't have helped me that much because media, schools and social groups I've experienced brain wash young women into being fragmented and dependent. After many boyfriends and broken relationships I've learned my lesson that dependent relationships don't work. This includes in business as well as with friends. My suggestion if it means anything to you is to pick up your shattered heart along with the rest of your chakra/energy system, tape it up a bit with plenty of daily self inner work and just maybe when you're feeling a moment of wholeness you just might score a honorable partner. Now that I'm in a relationship with a loving husband, extended family, honorable employers and reliable friends it still takes daily practice and plenty of scotch tape to keep any partnership together. 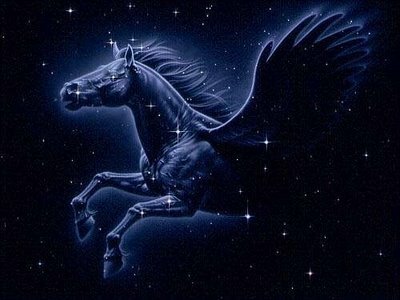 If you're in the country during late fall and away from bright city lights look deeply into the star Pegasus. Surrounding it will be more stars in the sky you can see from this myth. As you gaze into the stars you will see Cassiopeia and Andromeda. Imagine this ancient tale and rewrite it as you like it as well as any other tale that comes to mind. Be sure to share these old tales with your loved ones in a modern and non separatist way. When you catch yourself dismantling old chains and you're in the need of some swift movement call on Pegasus. He as well as the Phoenix is a bringer of inspiration and change. This is exactly the energy we need as we sit in the dark days of the year and allow our imagination to soar high as we vibe out who we wish to become in the New Year. I call this look my before and after yoga sari. This look is a perfectly chic and unique quick cover up. Go through your over sized scarfs and grab a belt. I suggest using wide elastic belts with this styling. As we pay respect to the wheel of the year cycling through its period of death and darkness it is important to pay attention to the emotions that arise as we face the void before the sun is reborn. Some maybe experiencing hopelessness or sadness while others may notice themselves moving into anger, judgement, jealousy, greed and ego. All of these emotions are by products of fear of the future. Try using this moving posture meditation shown if you are having a difficult time releasing old non serving memories or facing another emotional situation that requires loving guidance from above. As you ground into chair pose feel the soft earth beneath your feet accepting you. Your mind wanders into hopelessness as you can't see what's to come on the horizon. Take one hand and press down into your thigh feeling grounded while your opposite arm, heart and gaze reaches beyond the clouds as you inhale. Exhale as you move your hips back while the crown of your head and extended arm moves forward and somewhat level to your hips. Staying low to the ground feels comforting. Heat builds and it is impossible to stay in this fire any longer. Vapor rises above your sternum looking for air, space, light and your connection to source. As you ground your hand deeper into your thigh you inhale air, space and light into your upper body. This quality of vastness your feeling gives you room to twist where you again feel a balance between the sky and ground in your being. Although you appear beautiful and balanced feelings of standing on uneven ground begin to well up. You feel a crisp breeze with a strong presence riding it. Although you feel intruded upon there's a quality of hope and grace that rides this wind. To your surprise you realize this wind is coming from the wings of large feathered being hovering above you. You spread your wings welcoming it towards you. This creature's wings move like magic wands sending orbs of light for you to absorb. You are in bliss as you brighten your inner light. Yet a tear falls from your eyes as you realize this winged creature feels the fear you carry in your being. The creature is inspired to continue sending you greater waves of compassion through the air. There's a part of you that feels undeserving of such kindness. Your ego turns humble. The winged creature senses your lack of self love and sends you up soaring beyond earth's sight. You release more tears. Layers of anger, jealousy, attachments, blame and fear burn away as space, love and light run through you. In a flash you are touching the ground again. The magnificent winged creature is now only a vision left in your memory. However you now feel a super charged halo protecting you. You are confident in your steps ahead. You understand this brighter light you sense is leading you into the New Year. You too can fly on earth like the winged creature. Let's RISE like the sun into the New Year.